Ok, let’s continue! Matthew 2 continues to show how events in Jesus’ life fulfilled numerous prophesies – all before he was making any decisions about his young life. Matt 2:6 makes another reference to Jesus coming to save his people. I just want to know what the bible scholars say about this. I understand that the apostles spread the news of Jesus to the Gentiles… but it does make me wonder how much Jesus really cared about saving the whole world? Was he thinking about the rest uf us – about me? Or am I just an afterthought? 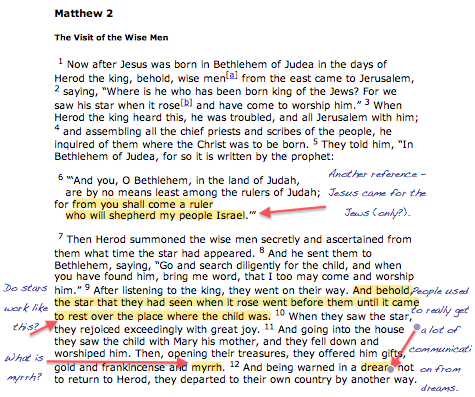 My next note comes from Matt 2:9, describing the star that the magi followed to get to Jesus. It’s pretty funny to me that the guys we love to include in the Christmas nativity (although they were not there on Jesus’ birthday) were basically in love with horoscopes (the things that my church said I should not even look at in the newspaper because it was a sin). Somehow, their magic and astrology-loving ways helped lead them to Jesus, which some believe fulfills more prophesies about who Jesus is. Interesting. Great – I’m glad that the star is a bit of a mystery to bible scholars, too. Seems a bit sketch, but then again, these guys were into magic, so who knows, huh…? I also noticed that people (namely Joseph, but also the magi) get divine communication from dreams. Is that why we always feel like sharing our dreams with people? I know that I have often wondered if there is extra meaning in some dreams I’ve had. Okay, Jesus’ family moves to Egypt! Cool! When I was a child, my church always put on Christmas pageants with the children. Usually it was always a variation of the nativity, with up-beat and exciting songs, reminding the congregation of how awesome and important Jesus’ birth was (even though, apparently, the story we perpetuate every year doesn’t even come close to pointing out all the prophesies that were fulfilled, and we always have the “kings” showing up at the wrong moment). But when I was in sixth grade, my church acquired a Christmas pageant that talked about when Jesus was living in Egypt as a toddler. Sixth grade was the oldest you could be to be in the pageant, so naturally I got to be the star, and I was Cleopatra. That’s right, even though it was a fun, new twist on the Jesus-as-a-baby story, it still wasn’t very historically accurate. I digress. So they stayed in Egypt until Herod died. How long was that? First I had to figure out which Herod this one was. I think it was Herod the Great (remember that there are two more King Herods that appear in Jesus’ life – Herod Archelaus who Joseph fears later in this chapter, and Herod Antipas who kills John the Baptist). Actually, I’m giving up on trying to figure out how long they were in Egypt, since it’s not clear what year they went there or exactly when Herod died. So this whole thing is called the “Massacre of the Innocents.” Apparently Herod was known for killing kids a lot, and did similarly terrible things on a much grander scale throughout his kingship to insure that he remained king. The historian Josephus wrote about Herod killing his own children to protect his position. However, there is doubt among many historians that this particular massacre even took place, as there is no other record of it. On the other hand, many scholars believe that the number of boys this massacre accounted for was probably less than 50, far fewer than other massacres of children Herod did throughout his life, and thus wouldn’t probably register as even a blip in the grand scheme of murders under Herod’s rule. So who knows. So Joseph gets a few more dreams that help save Jesus’ life. Hello, Joseph gets no credit in the church these days. Everyone talks about Mary – but Joseph is the one who was always getting the phone calls from God. Joseph is the one that is told to stay with and protect Mary, then move the family to Egypt, and then back, and then to avoid Herod Archelaus. In all of this, apparently, Jesus ends up in numerous places that had been prophesied that the Messiah would have been. That, my friends, is pretty cool (or, to the cynic, a well written story). Does anyone know how long Jesus was in Egypt? How do I get my dreams to mean something, too? I want God to talk to me in my sleep – or does he already? Or is this whole thing preposterous? Why can’t Christmas stories and nativities and pageants be more accurate? Do Christians really not care about these issues? It bothers me that we care more about the made up version of the story than what really happened. If Christians are willing to ostracize and even support legislation that stigmatizes anyone who doesn’t follow their brand of bible interpretation, why don’t they hold themselves to the same standards when celebrating holidays that are supposed to stem from things that happened in the Bible? Sigh.